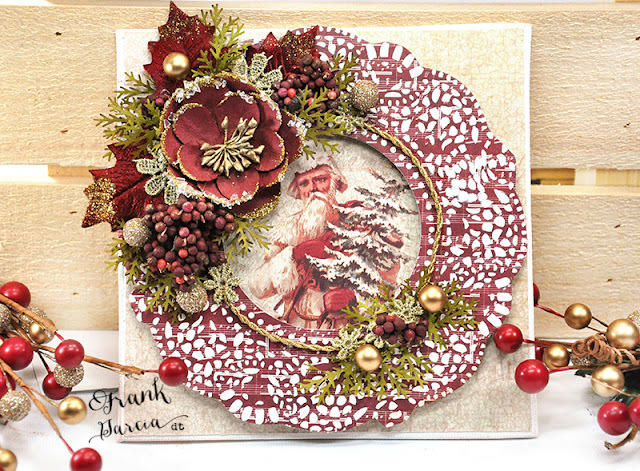 Prima's Victorian Christmas by Frank Garcia! If you don't have this collection yet, go grab it up. It's a Christmas collection and yet, once the holidays are over, you'll still be pulling this out and using the gorgeous non-holiday prints. This collection has stripes and polka dots and music notes. Can't get more versatile than that!! Today I feature the paper with the music notes - the "B" side of the paper. This is a canvas/card that I made with a lot of dimension. I put a variety of flowers in this card you can can see a good array of the collection. I am also gluing a card to the back of this to turn it into a card. It doesn't even have to be a canvas. It can stay a card and you can frame it. 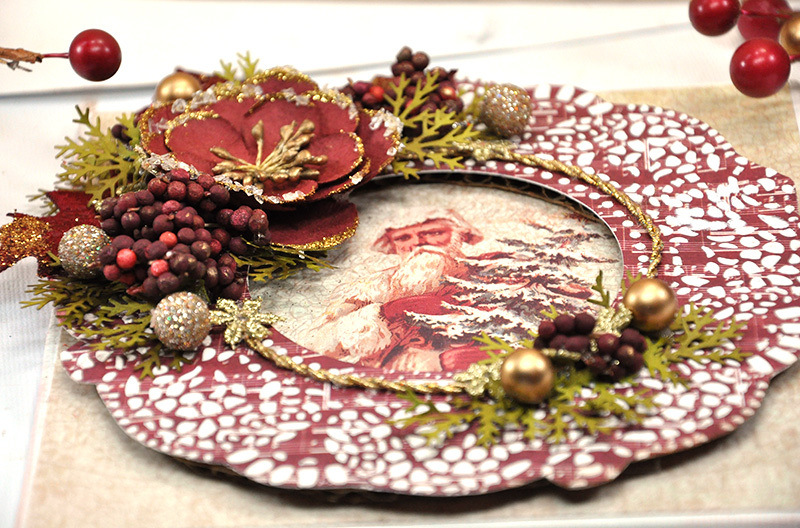 This collection has such rich warmth - perfect for a vintage flair. I actually used the 12x12 papers here because I wanted a pattern that was bigger than the 6x6 pad. I also have one of Prima's newly released stencils as a background. Scroll down a bit further and I'll show you how I made the base of my canvas/ card. But first a few more close ups. I'll even show you where you can still grab this collection. I started with some heavy white gesso and a stencil placed onto the "B" side of this piece of Victorian Christmas paper - the music notes side. 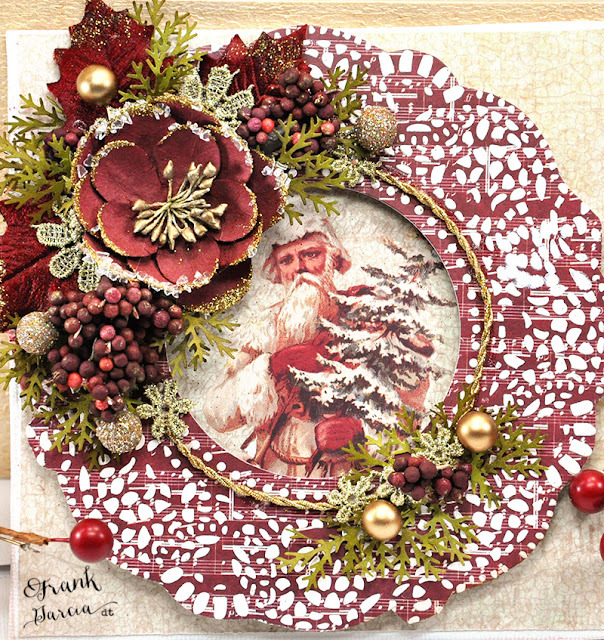 (Prima Frank Garcia Victorian Christmas Paper - Un e Carte de Noel). I used the heavy gesso because it tends to stay bright white. I find that molding paste often doesn't keep it's initial bright white color. When I want white - I'd like it to stay white, ya know what I mean? And this is how the stenciling turned out. I cut around it once it was totally dry. Pretty, right? Next I decided to make it a bit more dimensional. I backed it with cardboard and cut the cardboard out. To add the Santa image from the Prima Frank Garcia Victorian Christmas Paper - Un Chant de Noel paper, I simply placed the Santa image behind the stenciled circle and all is perfect! From there, I mounted this to my card, canvas or cardstock and finished embellishing. You can add flowers anyway you like, but to me, the construction of the base is the most important to understand. In my flower clustering, I used one main anchor flower and then add filler. 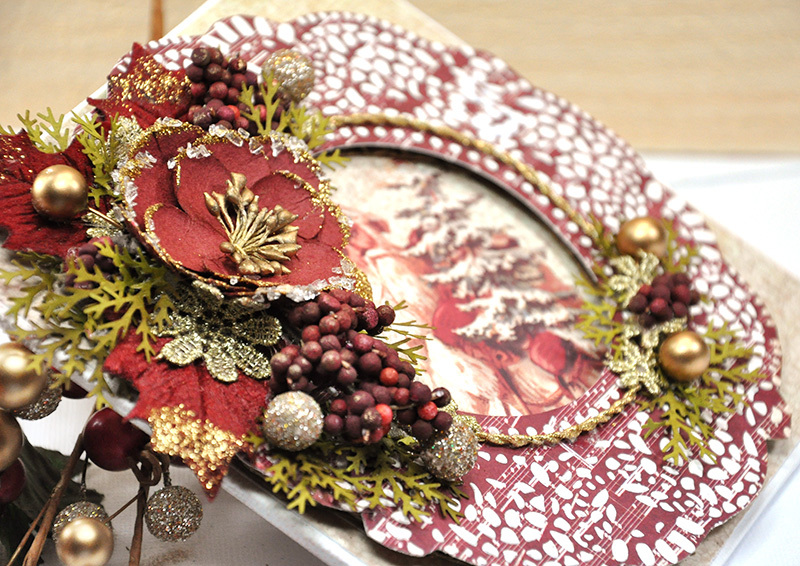 Filler in this case are the floral berries from the collection as well as some pine punches and little snips of gold trim and red holly leaves. Thanks for looking and stopping. Best of all, you can grab this collection right here at the Flying Unicorns store. This looks lovely....especially the way you've created that lovely dimensional 'wreath'... great idea as a card/canvas/Christmas decoration! Have a lovely Christmas!! A beautiful Prima holiday favorite!!!!! Love this idea !!! 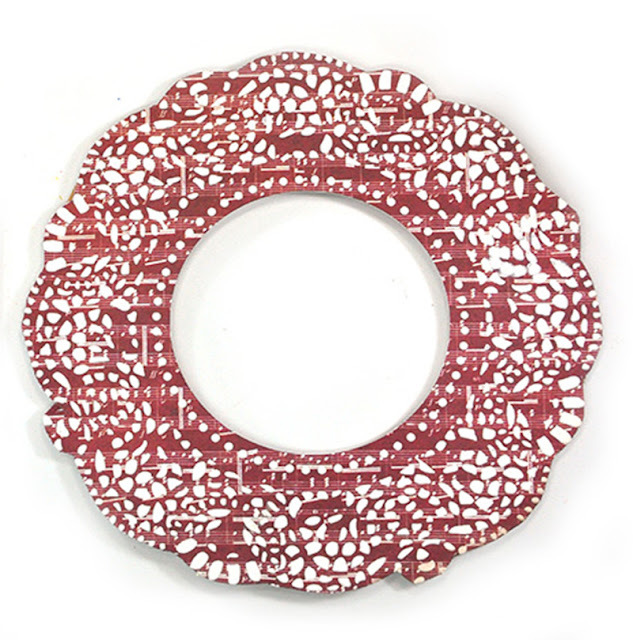 I think this looks like an old-fashioned Christmas plate. It is beautiful I love the stencil and I will be getting that one. Thank you for sharing your beautiful card.